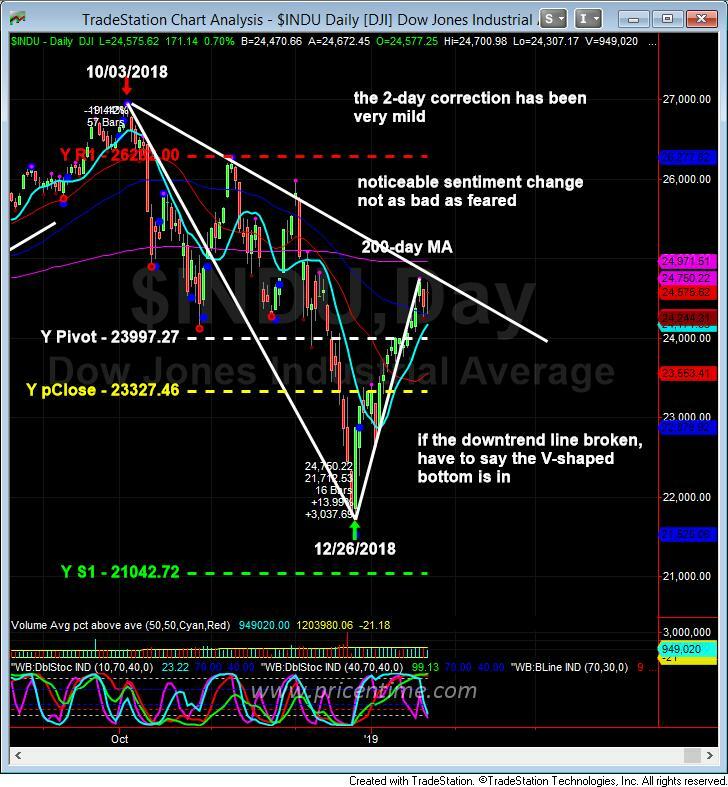 Last week we sent out a blog about the furious bear market rally and the pending market top that occurred on Friday 01/18/2019. After the long weekend, the market did give us the correction that was expected. However, the correction has been very mild. It seems that the big guys are buying up the DOW. Because of the strength, we went back and looked through the charts in the last 50 years. We have found 12 other periods where you have made advances of more than 13 percent over 17 trading sessions. And what we found is that eight of them have typically been V-bottomed and those are bottoms coming off of major market lows. And then the other four have been those double-bottom varieties, and they weren’t major bottom lows. In other words, the odds of the current December bottom is a V-shaped bottom are much higher than not. To confirm the V-shaped bottom, we only need the October to December downtrend line to be broken. The market is in a correction/consolidation mode, therefore it may take a few tries to take out the downtrend line. After the V-shaped bottom is confirmed, we are not expecting the market taking off immediately to make all time highs. It may be a sideways market for the entire 2019 while it’s working through some very serious fundamental problems. There is also noticeable sentiment change about earnings reports. Because the expectations are so low, the earnings reports have not been as bad as feared. Below is the reason why the microchip stocks has after market rally tonight. This is a classic sign of bottom that the bad news can’t drive down the price anymore. Texas Instruments Inc(TXN), Xilinx Inc(XLNX) and Lam Research Corp(LRCX) posted quarterly results on Wednesday that reassured investors concerned about U.S.-China trade tensions, sparking a microchip industry stock rally after hours. Dallas-based Texas Instruments(TXN) missed Wall Street’s estimates for quarterly revenue but beat on profit. Investors were fearing worse performance amid warnings of a slowing smartphone market from Apple Inc.(AAPL) TI also forecast first quarter revenue and profit below estimates. “People were expecting even worse results. It does not mean everything is behind them …we are still in downturn and what macro does in the next few months and quarters nobody knows,” Stifel, Nicolaus & Co analyst Tore Svanberg said. Xilinx (XLNX) surged 8 percent in extended trade after the programmable chipmaker’s quarterly results and outlook beat analysts’ expectations. The company said that communications revenue rose 41 percent, boosted by rollouts and preparation for so-called 5G cell phone networks in South Korea and, to a lesser extent, China and North America. Lam Research (LRCX), which makes semiconductor manufacturing equipment, jumped 7.4 percent after the bell following its better-than-expected quarterly results and its announcement of a $5 billion stock buyback authorization. The semiconductor industry had a tumultuous opening to 2019 with concerns of global tech slowdown with warnings from Samsung Electronics Co Ltd(SSNLF), Taiwan Semiconductor Manufacturing Co Ltd(TSM) and Apple(AAPL), which earlier this month cut its quarterly sales forecast due to poor iPhone demand in China. The Philadelphia Semiconductor Index is down 19 percent from its record high in March 2018. “Investors, for today at least, are probably hoping that cycle starts moving back up in the back half,” said analyst Chaim Siegel from Elazar Advisors. After hours on Wednesday the rally included shares of Applied Materials Inc(AMAT), KLA-Tencor Corp(KLAC), Nvidia Corp(NVDA) and Intel Corp(INTC), which reports its results on Thursday. Apple (AAPL) had blamed economic weakness in China and investors were seeking to learn more about China’s economic performance. They also wanted indications if any weakness was widespread or specific to Apple(AAPL). On a post-earnings call, Texas Instruments(TXN), which supplies touchscreen controllers, power management chips and a control device for Apple’s(AAPL) iPhones and iPads, said demand in China was weaker than other regions. Personal electronics and specifically smartphones were weaker, including Chinese smartphone manufacturers. “The weakness we are seeing is primarily due to the semiconductor cycle. In addition, the microenvironment, including uncertainty caused by trade tensions, could impact the depth and duration of this cycle,” said Chief Financial Officer Rafael Lizardi on the call. Shares of the Dallas-based company rose nearly 1.37 percent to $96.80 in after-hours trading. Texas Instruments (TXN) said revenue overall fell 1 percent to $3.72 billion. That missed analysts’ average estimate of $3.74 billion, according to IBES data from Refinitiv. TI’s net income surged to $1.24 billion in the fourth quarter ended Dec. 31, from $344 million or 34 cents a share a year earlier, thanks to a significantly lower provision for income taxes. Excluding one-time items, the company earned $1.27 per share, beating analysts estimates of $1.24. The company expects first-quarter revenue of between $3.34 billion to $3.62 billion, and earnings of $1.03 to $1.21 per share. This entry was posted	on Wednesday, January 23rd, 2019 at 7:55 pm	and is filed under Forecasts, Member Only. You can follow any responses to this entry through the RSS 2.0 feed. Both comments and pings are currently closed.